Synopsis: Interstellar stars Matthew McConaughey, Anne Hathaway, Jessica Chastain, Bill Irwin, Ellen Burstyn, John Lithgow and Michael Caine. With our time on Earth coming to an end, a team of explorers undertakes the most important mission in human history; traveling beyond this galaxy to discover whether mankind has a future among the stars. After striking it big with The Dark Knight trilogy, director Christopher Nolan has earned himself carte blanche in the blockbuster realm. He’s also earned the right to deliver bold stories with unique premises on budgets that are typically reserved for franchise films. Nolan is, in a lot of ways, one of the last directors capable of making indie films on studio-sized budgets. And so, with all that freedom comes high expectations. Fans want every Nolan release to stand against the likes of The Dark Knight and Inception; they want a film that entertains, intrigues, and surprises from beginning to end. 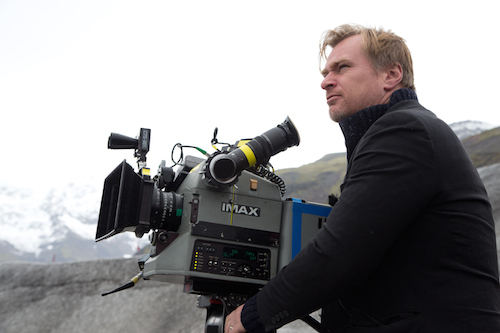 Therefore, very heavy expectations were placed on Nolan’s latest film, Interstellar. But, as is the case with films that carry such heavy hopes, Interstellar inevitably disappoints on some pretty fundamental levels. It also astounds, amazes, and entertains right there along with the best of Nolan’s filmography. Interstellar is simultaneously the science epic Nolan promised, and the four-quadrant blockbuster that Paramount wanted. It falls back onto cliched story beats but then turns around and proposes some wildly outlandish, oftentimes brilliant ideas. The movie defies quantification, and yet is so easy to distill into a few sentences. If that sounds a little obtuse it is by design. Every Nolan fan deserves to go into Interstellar knowing as little as possible. All one really needs to know is that Interstellar‘s main focus is on discovery. That discovery comes in many forms, but the most obvious manifests in a last ditch effort to find a new home for Earth’s population. Our planet as we know it cannot sustain life much longer, and so a former engineer named Coop (Dallas Buyer’s Club‘s Matthew McConaughey) joins a small interstellar expedition, called Lazarus, whose sole purpose is to try to find a solution. However, in taking up this mission, Coop accepts that he may never see his kids again. There’s obviously a lot more to Interstellar, but…no spoilers. So without being able to explain the plot in detail, and without trying to give the best bits away, how does one review Interstellar? What can be said about the film is that it features some incredible visuals, portraying space in a way few films ever have before. Nolan clearly relishes the opportunity to take audiences to space, but he smartly doesn’t overuse the setting either. Rather, he saves the money shots for very important moments, and instead keeps the focus on the Lazarus crew. There’s plenty of awe and wonder in Interstellar, but the sparse use of visual effects helps reinforce our connections with these characters. It also bridges the gap between audience and subject, putting us right in the thick of it. It is for that reason that the IMAX presentation is ideal for Interstellar, as the booming sound system helps put you right in the thick of the action. 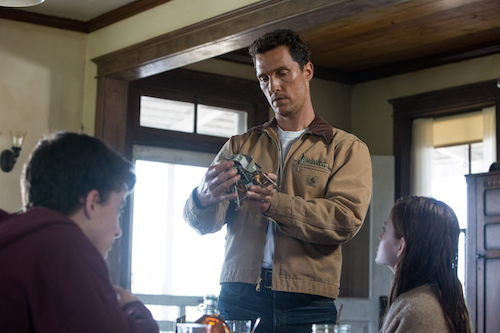 Narratively, Interstellar juggles a lot of ideas and plots, and it struggles to give each one its due. There are some elements to the story that are smart and thought provoking and others that are extremely hokey. As was mentioned, this is as much a family adventure as it is a think piece, and unfortunately that duality occasionally gets in the way. You want the film to be exciting, but when it falls back on obvious plot points it’s hard to not be disappointed. And then, when the film starts really reaching for some far out ideas it toes a line of believability that will likely turn some people off immediately. These concepts are nonetheless interesting, but they aren’t necessarily successful. Ambition is always admired, but when the set-up for a film has been mostly rooted in one thing – in this case realistic science – and then it switches gears it’s jarring; not enough to ruin Interstellar as a whole, but enough to color one’s overall impression of the film. Ultimately, though, Interstellar leaves a strong impression, no matter how you feel about its many component parts. Nolan’s ambitious science film has so many individually appealing elements that it’s an easy recommendation, and its more creative ideas help elevate what is, in some parts, a very straightforward story. The acting is excellent across the board, which really helps with a consistent tone, and the dialogue is satisfactory. On the visual and design front, Interstellar makes its strongest cases and is impressive on so many levels. Even the elements that many will recognize as imperfect (mainly those in the final third) have noble intentions and are far from offensive. They just don’t click with the higher brow subject matter. There’s no question that Interstellar reaches for the stars, but as a complete piece of cinema it doesn’t quite get all the way there. Christopher Nolan’s touch is all over Intersteller, from the production design to the cinematography to the music. Obviously, the people responsible for those elements deserve recognition as well, but it’s clear that Nolan steered this spaceship and the fact that Interstellar reaches its destination is an accomplishment all its own. He knows when it’s time to delve into detail and when to leave things ambiguous, and with a film this science heavy finding that balance must have been difficult. Similarly, it’s hard not to marvel at the film’s aplomb – the way it mixes big budget visuals with clever science. And even if it may not succeed in every aspect, the Intersteller still offers so much to enjoy and to think about long after it has ended. That in itself makes Nolan’s work worth commending.